The story begins with Jamie trying to convince his mother not to go out, because she's too drunk to drive. She says strange things, like how she's given 6 years of his life to him (he's 12), and then she leaves. She dies in an accident, and Jamie is sent to an orphanage called Hermitage House. 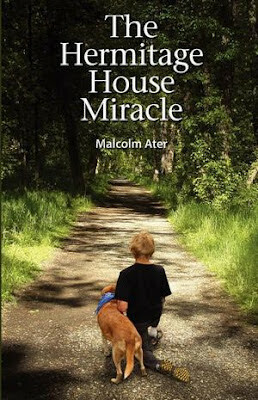 Once there, he starts to have dreams, about a small boy with a mother and father, and a dog. He feels like he is the little boy, but the mother in the dream is not the mother he knew, and he never knew his father. The Hermitage House Miracle has fantastical aspects, but it's not a fantasy. It's delightful to read, because it's like it takes place in a slightly more magical version of the real world. As the story unfolded, and Jamie learned more through his dreams (and a magical arcade game) about the little boy and his dog, I was hooked. The mystery really sucked me in and I was completely invested in Jamie and how things would turn out for him. My only complaint is that there's a bit of shifting perspective going on that could have used some polishing. The perspective sometimes changes within a paragraph, which can disrupt the flow at times.